The first air tanker in world military history that can refuel planes in complete darkness is undergoing tests ahead of the expected US Air Force acquisition. A total of 179 of Boeing’s KC-46 'Pegasus' tankers will be delivered by the end of the 2017. 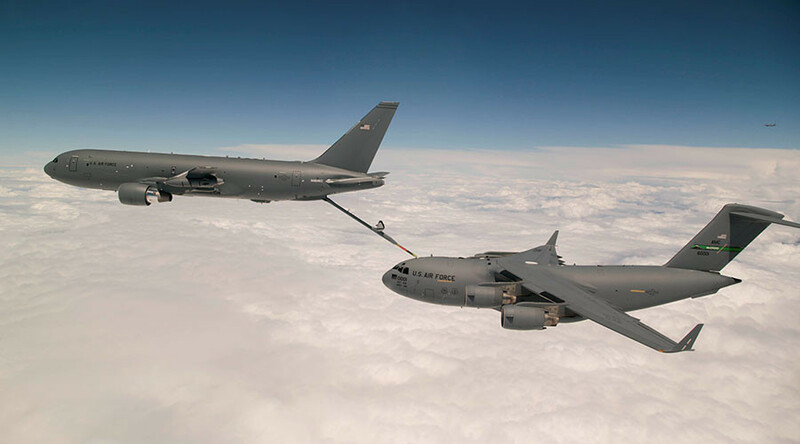 The new fleet of ‘aerial gas stations’ are set to replace their predecessors, the KC-135 Stratotankers, which have been in service since the Eisenhower administration. In an emergency, the new KC-46 is also capable of carrying over 100 troops, 54 medical patients or 65,000 pounds (29,500 kg) of cargo, reports CNN Money. The US Department of Defense has allotted $3.1 billion of its requested 2018 budget of $639.1 billion to pay for just 15 of the tankers. The Pegasus boasts an array of aerial countermeasures to defend against anti-air missiles. It also houses a suite of high definition cameras and infrared lights which allow it to carry out its stealthy midair refueling operations. The 'gas station attendant' commands a high-tech system which includes stereoscopic cameras with 185-degree visibility projected through 3D glasses to give the boom operator complete depth perception. This project has proven to be somewhat of a coup for Boeing, as US military top brass have remained skeptical throughout the project's development. The first successful 'lights out' test was carried out in December when the KC-46 refueled a massive C-17 cargo plane in pitch black skies. The KC-46 is specifically designed for combat operations with an impressive 10-minute start up time from hangar to take off. This is made possible by the access hatch underneath the plane's nose which removes the need for boarding staircases for the crew.